pH+ are pleased to announce that we have been shortlisted for the Housing Architect of the Year Award at the Building Design Awards 2016. 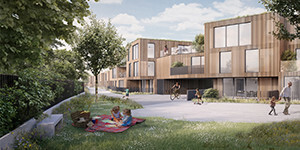 The shortlist of eight practices include pH+ Architects, Levitt Bernstein, Sergison Bates, Mikhail Riches, Bell Phillips Architects, PRP Architects, Lifschutz Davidson Sandilands and Mae Architects. The Building Design Online Architect of the Year Awards 2016 ceremony will be held on Wednesday 9th March in ExCel London and will be hosted by Stephen Fry.